Hi all. I've decided that as my sort-of-new-years-resolution was to take more photos, I'm going to make Friday my round up of my favourite things from the past week day! Hopefully this will encourage me to take more photos, but I'm also going to include things I've found online, and seen or heard out and about. Hopefully you'll all enjoy it! It's also good on white toast from the bakery - or on just about anything! My newest favourite blog, Lovely Indeed. 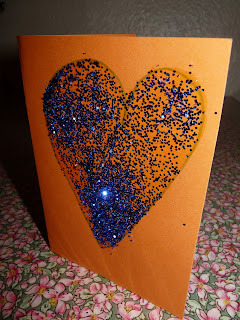 My lovely Valentines day card which has filled my handbag with blue glitter! Buying birthday presents for best friends, and making presents for soon to be new ones! I hope you've all had a lovely week too, have a smashing weekend!